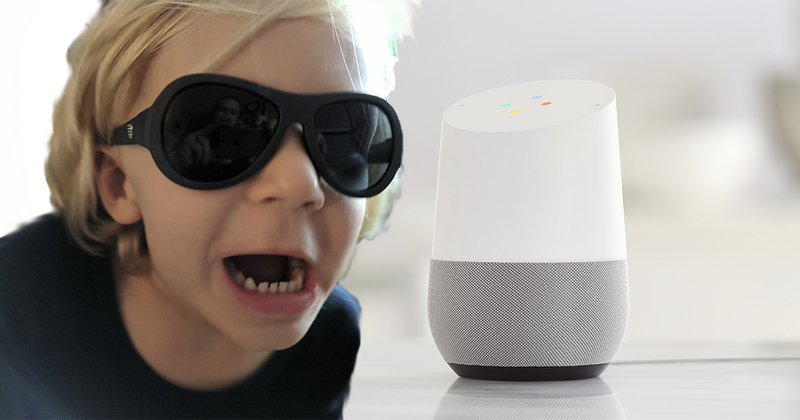 Recently I decided to give the three year old unfettered access to make phone calls to friends and family from Google Home. It was a great decision, and has been hilarious (at least on our end of the line)... He has pretty much called everyone in his contacts save for a few (so if you haven't been called yet be on the lookout). Create a Google account for the kiddo (Google doesn't officially support accounts for children under 13 outside of their new Family Link service, so you may or may not be awarded points here for creativity on the DOB). Add contacts with friendly nicknames to their account (contacts.google.com). Link the account to your Google Home by signing into the Google Home app on any device with the kid's account and setting up another user. In the top right corner of the app home screen, tap Devices. Find the device card of the Google Home you'd like to link. From the device card, tap the blue banner labeled Multi user is now available or Link your account. Follow the remaining instructions and be ready to have the kid do the voice training). [Optional] If you want to set up a Google Voice account the Google Home can show an outbound number (otherwise calls are displayed as unknown). You'll need a real number to link the Google Voice account to for setup purposes. That's it. Now your toddler can all anyone in their contacts (as well as businesses) at anytime with just their voice. What could possibly go wrong?! Note: Emergency calls to 911 are not supported by Google Home.